Do you think it's right that..
• over 50 pubs are closing every month? • 8 out of 10 pints served contain less than 100% liquid? Of course you don’t and neither do we. If you want to find out more about your favourite real ales, campaign for greater consumer choice as well as helping to safeguard the future of British beer and pubs? 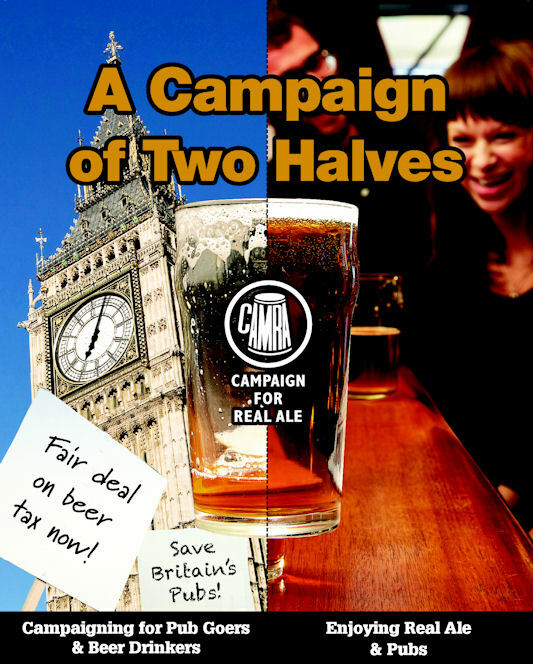 Then look no further - join CAMRA, the campaign for real ale today. It takes all sorts to campaign for real ale. Membership is now over 110,000 – but we still need your help. Our members are of all ages and interests who, above all, enjoy celebrating their favourite product – real ale. Exclusive members newspaper - 'What's Brewing' A monthly colour newspaper informing you of beer and pub news and detailing events and beer festivals from around the country. Exclusive members magazine - 'BEER' A quarterly copy of the magazine ‘BEER' which is packed with superb features on pubs, beers and breweries. Free or Discounted entry to over 160 beer festivals Free or discounted admission to the 160 + beer festival that CAMRA organise, including the Great British Beer Festival. Branch Social Activities One of over 200 branches covering the UK, Herefordshire is a very active branch with a major annual beer festival, a very stong record of campaigning and a full programme of social events. Active Campaigning Have the chance to campaign to save pubs under threat of closure, for the right to receive a Full Pint and a reduction in beer duty that will help Britain's brewing industry survive. Book Discounts CAMRA produce a variety of books every year and as a member you are entitled to discounts on all of the books we produce including CAMRA's best-selling, annual Good Beer Guide. £20 worth of JD Wetherspoon real ale vouchers. 8% off holidays booked through the Thomas Cook Holiday Club. 20% off Ramada Jarvis 'Bed and Breakfast Best Flexible Rate of the Day'. Discounted Membership of the CAMRA Beer Club. 10% discount on all holidays booked with cottages4you. 5% discount off canal boat holidays (and benefit CAMRA's campaigning funds.